"If for some reason, we make some giant mistakes and IBM wins, my personal feeling is that we are going to enter sort of a computer Dark Ages for about 20 years. Once IBM gains control of a market sector, they almost always stop innovation. They prevent innovation from happening." 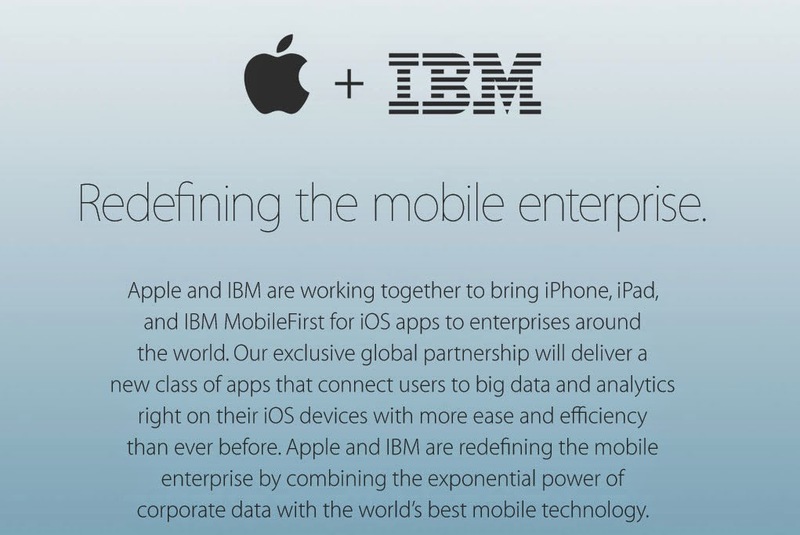 Thirty years after the 1984 Super Bowl ad that imagined a bleak future with IBM in control, Apple has formed an exclusive partnership with IBM to bring enterprise solutions to the iPhone and iPad. Apple CEO Tim Cook is no stranger to IBM. He was IBM's North American Fulfillment director for its personal computer business for 12 years. Apple has worked with IBM before. From 1995 to 2005, Macintosh computers and laptops were built on the PowerPC architecture. But, as you can see from the Steve Jobs quote, Apple and IBM have been fierce competitors. Somewhere along the line, Microsoft replaced IBM as Public Enemy #1. In Apple's mobile phone era, Google became a target after purchasing and developing a competing mobile operating system, Android, while then-CEO Eric Schmidt was still on the Apple board. After Samsung scored hits with the Galaxy SII and SIII, Apple focused on the South Korean company. IBM announced in 2004 that it would be selling its PC division to Lenovo. While Microsoft, Google and Samsung are still competitors, IBM hasn't been competing in the consumer hardware or software industries for years. It's interesting that at a time when Apple is about to introduce at least one new product category, as Tim Cook has promised, that a deal like this can still be done. The iPhone and iPad, without plan or design, took over enterprise as employees brought in their own devices, like myself. Even though none of this was planned by Apple, the Cupertino company is ready to take full advantage of the current situation at the workplace. So, when can I replace Outlook at work?